Long ago, in the kitchen of one of Montreal’s finest restaurants, I was taught that a truly fantastic soup can be made from a mere handful of humble ingredients. What made the soup exceedingly good was the quality and freshness of the ingredients, and the method used for cooking. 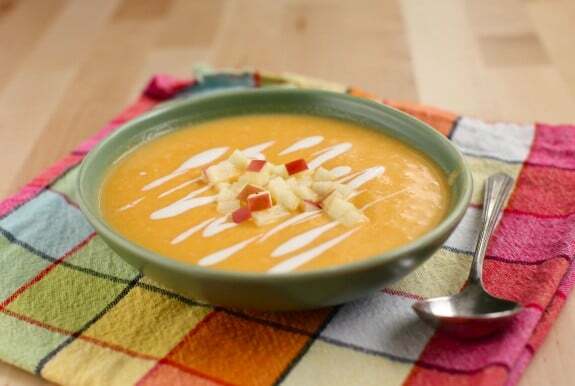 Over the long, frigid Montreal winters, we cooked batch after batch of sous vide butternut squash, and pureed them with a splash of cream for a velvety soup with vivid color. Night after night, I filled bowls with the rich potage, and topped it with delicacies such as seared foie gras, sauteed wild black trumpet mushrooms, and a pomegranate juice reduction. Sublime. 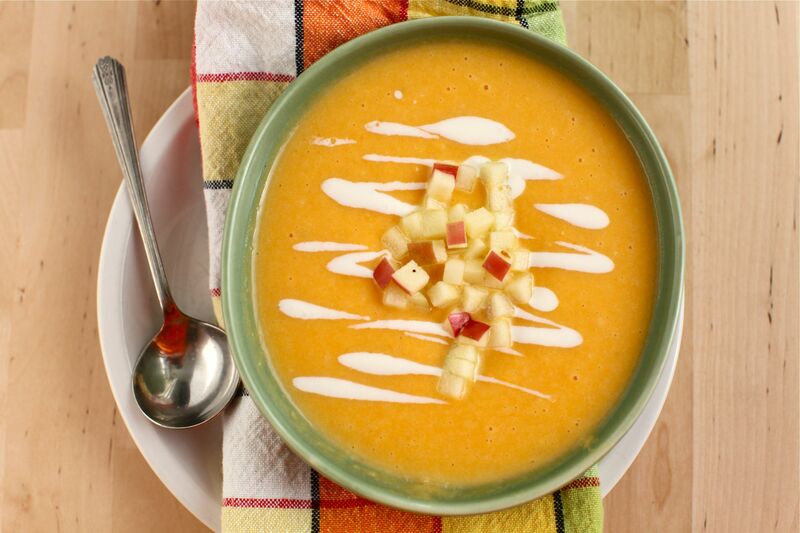 Today’s recipe is inspired by those upscale bowls of soup: a simple combination of apple, squash and onion, seasoned with salt, and thinned with a little cream. Garnished with diced apples, it’s fall in a bowl; and yes, it was cooked sous vide. Now, I’m a fan of simple soup from scratch, and will be the first to admit that a sharp knife and a sturdy pot are the only requirements for a good soup, be it rustic, roasted or rich. Alternately, I also have enough of a background in professional cooking to know that ingredients slowly cooked in a water oven (or sous vide) will yield a superior soup. Ten years ago, when I was manning the stove in various restaurants, the culinary term ‘sous vide’ was virtually unknown to anyone outside of processionals. Now, thanks to crazy-popular TV shows such as Top Chef, Master Chef, and Iron Chef, sous vide is fast gaining on culinary terms such as ‘braising’ or ‘searing’. There are even cookbooks devoted to the subject such as Under Pressure: Cooking Sous Vide and Sous Vide: Help for the Busy Cook . When the kind folks behind Sous Vide Supreme contacted me to try one of their counter top water ovens, I agreed, as I was eager to see this beautiful new home version for myself. It has been really fun to recreate some of the recipes for my family I had tucked away from my restaurant days. Danny, armed with his copy of Cooking for Geeks , is pretty excited to get into sous vide cooking. Being our resident numbers guy, he of course loves the science behind the sous vide method and I’m more than happy to let him share the kitchen. I can see the sous vide supreme working out very well for our family thanks to my background and Danny’s obsession with temperature. We’ll keep you posted. What makes a sous vide soup superior? When cooked slowly, in a water bath, vegetables and fruits retain their full color and flavor as well as undergo a remarkable transformation in texture. Once pureed, the flavors seem intensified, and the resulting texture is soft and velvety. With just one bite of this soup, Danny was smitten. We’re going to be enjoying it all winter long. Fresh fall ingredients, cooked together sous vide, make for a surprisingly sophisticated soup. 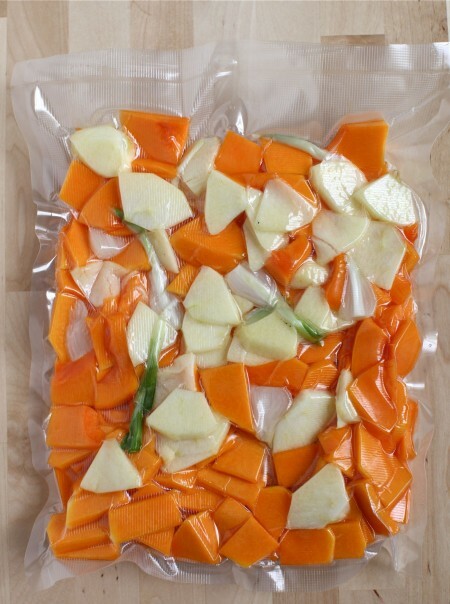 Fill 2/3 full with water and preheat the sous vide unit to between 182 and 185 degrees F.
Place the sliced squash, apple and onion into a large, one-gallon food-grade pouch. Vacuum seal the bag to remove as much air as possible. 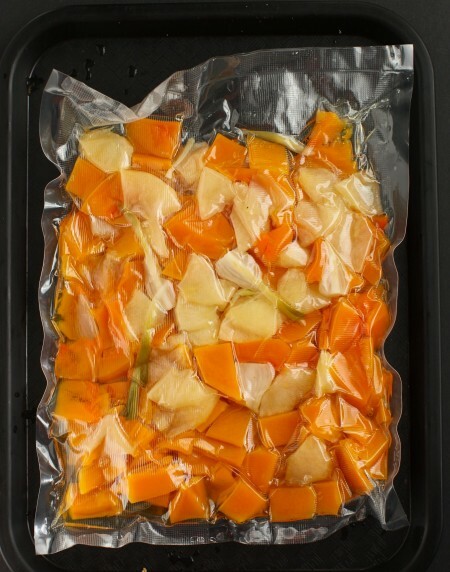 Submerge the pouch in the sous vide unit and cook for 2 hours until the squash and apples are quite soft. Check the pouches after 20 minutes to make sure they’re fully submerged. If they are floating, weigh them down with a mug or other heavy object. When the squash is cooked, remove the pouch from the Supreme, and pour the contents into a blender. Puree until smooth. Add sea salt and cream and puree again. Taste and add more salt if you like. Serve hot, garnished with diced apple if desired. Are you familiar with cooking sous vide? Is it a technique you would like to learn more about? It definitely sounds interesting! I love soups, and many days during the winter I have a pot of soup on. It helps me use up veggies, and seems like such a comforting meal with a little homemade bread on the side. The soup sounds delicious, but I’m sure I can’t be the only one concerned about cooking in plastic. What kind of plastic is it? I won’t be trying this method, but is the plastic purported to be safe? It certainly isn’t safe in any old plastic bag, but according to the Sous Vide Supreme website, all of their vacuum/seal bags have been third-party tested and are certified free of BPA, phalates and lead. I also am interested in the method, but having done my research, I really don’t feel comfortable with heating food in plastic of any kind, even those that claim to be safe. Ten years ago everyone thought BPA wasn’t a problem for food safety. We know better now about BPA, but there are still too many unknowns about plastic and what leaches from it when it is heated. It is too bad! So freakin’ cool! This soup looks like such a marvelous (and unexpected) way to sous vide! A sous vide machine costs $400, far beyond the reach of most households. Is there any way to approximate this method for those of us who will never have one? Yes, it is an investment, however there are plenty of hacks out there like this Magic Cooker (http://www.tinyurbankitchen.com/2010/05/sous-vide-salmon-in-magic-cooker.html) or, even easier, a beer cooler (http://www.seriouseats.com/2010/04/cook-your-meat-in-a-beer-cooler-the-worlds-best-sous-vide-hack.html). The cookbook ‘Cooking for Geeks’ has some fun suggestions as well. Hope that helps! That is a new technique to me, but I would love to learn more! I make butternut squash soup all the time and it’s delicious!! And yours looks even better! But, cooking in plastic….that doesn’t seem so good. We really don’t want to drink water from plastic water bottles….especially ones that get heated by the sunshine….and we don’t want to store our food in plastic because those containers also leach into our food….especially if the food is hot when placed in the container. So….how is it okay to use plastic to cook the food? We’re all trying to keep the chemicals out of of foods….. Love to hear your thoughts. I have been on the hunt for a good butternut squash and apple soup recipe and I’m so bummed this one requires special equipment. What modifications are necessary to cook in a plain old soup pot? The addition of leek is really nice and they are in season now, as an added bonus. Thanks for this! I’m always looking for ways to REDUCE the equipment in my kitchen, so I’ll certainly be trying the “traditional” method! Yes, I am familiar with this method. It always nice to introduce an unfamiliar or new method to the masses-knowledge is power. I’ve always been interested in the texture of meat cooked sous vide. I have yet to try it. Nice intro and the soup looks amazing. I haven’t tried apple in my butternut squash soup but I must try it now! This looks, sounds and I am sure smells so yummy. I like the idea of adding leek in too like mentioned above. Thanks for the inspiration! Look delicious! I’m so gonna cook this. Thank you for the great recipe! Is it possible to freeze the ingredients in the bag and make the soup later? Looking for easy meals for my vegetarian daughter-in-law after having baby baby #2. I added about a tablespoon of peeled crushed ginger to the packet before cooking. It added a new flavor dimension to the soup. I have made butternut squash soup for years but never this easily. Tried this, but the squash put off so much gas that the bags floated uncontrollably. They swelled up like balloons. Definitely need a really good rack for your cooker to pull this off. Simple is fine but try adding :1 c. diced leeks (I get frozen ones from Trader Joes), ½ tsp. ground cumin,, 2 tab. chopped fresh garlic , 1 tab. ch. fresh ginger, 2 tab. pure maple syrup, 2 tab. soy sauce. After you puree add in 1/4 c. calvados and 1/4-1/2 c. dry sherry (to taste). Takes this soup from good to awsome! If you try this let me know what you think.